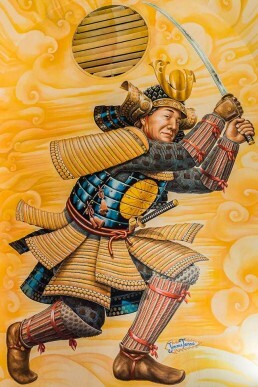 The figure of Jimmu Tenno, whom our virtual cover is dedicated to, comes from Japan, and he is the point of connection between the kingdom of the Gods and the very human terrain of political power. He himself is a divine being who demonstrates a strong human component, and for these reasons he is well known today by his descendants. 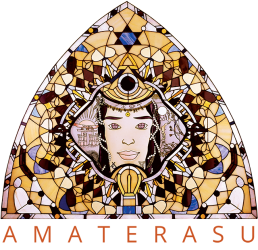 According to the most well known versions of the story, in the 7th century BC, Jimmu – who is a direct descendant of the solar goddess Amaterasu – was making moves to conquer the entire Japanese archipelago. This is the mission for which he was incarnated, and he succeeded in the intention to unify the majority of what is now modern Japan, becoming its first Emperor. At this point, he emerges from mythology and becomes a historical figure; he established his capital in Kashiwabara on the island of Honshu, and from there he governed his people. Jimmu Tenno is a hero who becomes human, a divine descendant who, once he realized the task that was assigned to him, gave space to his human side, which called him to the duty of governing the kingdom that he has built. His figure, straddling mythology and history, contains a message that is still relevant today, perhaps more relevant now than ever. This message resonates in a world that cannot decide between insisting on the divisions that are tearing it apart, or creating space for all the flowering buds of rebirth that span the worlds of art, spirituality and science. Engaging in politics can be an act that is inspired by Above and not simply one that is connected to personal ambition, power and ideology. Leading a nation, a city, a land, means putting forth your best energy, and making your passion and intelligence available for the common good. However, the inspiration that comes from Above, from what we call the “spiritual ecosystem” in Damanhur, needs to be found within. Each one of us carries a drop of the divine energy that colors the universe. Each of us is a sleeping divinity who is reawakening. So, the energy, inspiration and stimulus for offering your own commitment is to be found within. Jimmu has fought more wars than we think should ever be fought: no wars, ever. Beyond this, learning from him more than 2,600 years later leads us to believe that politics is a noble aspect of our community life, one that is based on the unification of a popolo, a people, that is: achieving a shared identity. Religious terrorism, immigration, the inequality of wealth, environmental degradation, and all the other difficulties that afflict the planet can only be solved if we face them on a level that is not only economic-political-programming, but also based on ideals. A spiritual plan is needed, in order to save the material world! Most of all, Jimmu Tenno, a descendant of the Goddess of the Sun, the creator of an empire that still exists today, whispers a message in our ear saying that no one is ever just divine, and no one is ever just human. Within us, these two natures complete each other and make us human beings so whole and complex that we are capable of very great achievements. Today, the greatest enterprises are those that allow us to recuperate the awareness of who we are, and to direct our land, our village, our community, and the entire planet, toward a coexistence of peace, well being and mutual respect. Is this the call of Jimmu Tenno, who not by chance resounds at the beginning of this new year? Probably yes. Listen too, within you, to the voice of this ancient and very modern hero. He speaks of the union of that which is human with that which is divine, and how myth enters directly into history. So, find your own way of participating in history, making the planet a happier place, as this is what the world awaits from you. Shall we ever prevent the passions from being destroyed by the insatiable appetite of most of the human beings around us? Since the people around us are us (like us), the best way to show this is possible is by assuring it happens in our life. Thank you for sharing your thoughts, and we wish you a good day, Luigi! Beautiful and true. While we move away from duality and into Oneness we experience the turbulence of the material world in all its aspects. Thank you Damanhur for the wise thoughts as always. As all big changes, also this one is a bit turbulent, but we can be only grateful to live in this amazing times. Thank you for sharing your comment, Akhon, have a good day! As we move forward with this Martian energies above us, is quite clear your approach. Still, Creation, Preservation of Creation and Destruction of Creation, remains, an Universal Law. Warriors of all times, the spiritual ones, knew this law, and they did their best in order to serve it, in order to maintain the balance of manifestation. Is equal outward and inward. Is just a matter of choice, if we destruct only to recreate or we create knowing that our creation will be destroyed, eventually.